Entrance to Braidwood House where wheelchairs were dumped. 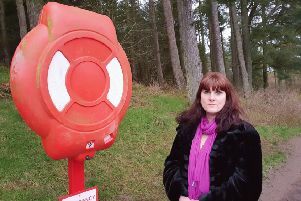 The eerie sight was noticed by a Braidwood villager taking her dog out for a walk and she had tried to solve the mystery herself by phoning the NHS and other agencies. All denied knowledge or ownership of the wheelchairs. We speculated that the wheelchairs might have been left over from the mansion’s long-past days as a home for cerebral palsy sufferers run by the charity Capability Scotland. There was also the possibility they had ‘fly-tipped’ by a defunct private care home. Less than 24 hours after the Gazette was published the truth was known. Yes, crime WAS at the heart of the mystery...but a more serious one than just fly-tipping. An agent acting for the current owners of the mansion contacted the Gazette to say that the wheelchairs were indeed left over from the house’s Capability Scotland days and they had been used as impromptu wheelbarrows by thieves stripping lead from the property’s roof. He said there were,in fact, around 20 old wheelchairs lying about near the entance to the mansion’s grounds, the thieves obviously having carried the lead from the property to a waiting van or lorry on the road passing the grounds. Nobody in the village had apparently seen or heard this crime taking place, probably as it was conducted in the dead of night; the mansion is also well hidden behind the trees in the grounds. The agent added that he thought the thieves might not be local and may even have travelled over the border to get at Braidwood House’s roof lead. He recently disturbed two males coming out of the mansion “obviously up to no good” and they had verbally abused him.